We’d love your help. Let us know what’s wrong with this preview of Mango Summer by Agay Llanera. For the first time in a century, the fruit in San Antonio's most famous mango farm all turned sour. Fiona, thirty-six and single, knows why. According to her family's legend, the only way to keep the mangoes sweet is for the women who run the farm to be married and bear children. If Fiona doesn't find anyone soon, the inheritance her family has been protecting for generations is in danger of rotting away. To ask other readers questions about Mango Summer, please sign up. It’s been a while since I last read a romance novel and by golly gosh was I glad to pick up Agay’s latest. I only knew about this book when I read the synopsis from one of the #romanceclass ladies and I knew this book was going to be amazeballs. Kiddie meal guy? Check check. First lines of the first chapter...oh my god. That vivid description of smelling ripe mangoes took me back. Holy crap. I don’t have the same verbose writing skills as Agay, so you just It’s been a while since I last read a romance novel and by golly gosh was I glad to pick up Agay’s latest. I only knew about this book when I read the synopsis from one of the #romanceclass ladies and I knew this book was going to be amazeballs. First lines of the first chapter...oh my god. That vivid description of smelling ripe mangoes took me back. Holy crap. I don’t have the same verbose writing skills as Agay, so you just have to read it to believe it. But in all seriousness, this book feels like the height of Agay’s skill. The characters and the story reel you in and there’s just no way of keeping your feelings in check. I should know...I’m still recovering from the after effects of a major book hangover. - There was a certain natural flow to how easy I liked the characters. Maybe because I’m Pinoy. I loved the dialogue and how well-paced the story was. - The story could have been written to a straight up HEA after conflict resolution, but I loved how Agay took time to get the characters to grow with each other before deciding on a life-changing event. - The food descriptions. It made me miss home sooooo much! I buddy read this with a fellow #romanceclass reader (hi, Kristin! ), something I haven't done before, which made the experience all the more special! Second: Mad appreciation for the Filipino-ness of this novel. The fantasy approach (about how the mango trees weren't bearing sweetness) ties in with how superstitious and somehow traditional a I buddy read this with a fellow #romanceclass reader (hi, Kristin! ), something I haven't done before, which made the experience all the more special! Second: Mad appreciation for the Filipino-ness of this novel. The fantasy approach (about how the mango trees weren't bearing sweetness) ties in with how superstitious and somehow traditional a big part of our culture is, and the details that come along (town living and mentality) are on point. Third: Here for the age-gap romance! I like how the main character, Fiona, is older and is breaking societal standards by how she lives and what she stands for. (The male race from all over the world can also take a page from Greg/G-Boy's book—what a guy, seriously, what a guy.) Over the past years, I've been reading voices younger than mine, and it's refreshing, if not enlightening, to return to that more experienced mindset—one that I myself could take cues from, re how to go through life. Fiona knows what she wants, what she should do and what she deserves, but at the same time, she's grappled by the what-ifs and what-could-have-beens. Very nicely done emotional tug of war. "When was the last time she’d verbalized her gratitude for life? Things weren’t perfect; they would never be. Her pickup truck was on the verge of dying, one of her old-time employees resigned, and someone left a bad review on their website. But here she was, doing something she loved, lying beside someone she loved, living in a place she’d loved since childhood. The realization sent happiness surging through her veins. Yes, thank you, she prayed. I’m grateful." loved this. loved that Fiona was older than Greg and we get the best friend's brother trope. Loved the family story laced with an undercurrent of magic so you're not quite sure if it was true. But I was intrigued from the beginning. "Magic is wild, her mom used to say. You can't tame magic. It plays by its own rules." I was supposed to write a full review on my blog for this but alas, I. Is. Busy. As. Bee. LOL. I'm sure I already psyched you up with my previous mango bookstagrams but omg, you should check out my livetweet thread while reading this! It was fun! "Sometimes, life reveals itself clumsily. Yet Greg feels something has progressed between him and Fiona . . . "
I have read most of Agay's books and she's one of my f "Magic is wild, her mom used to say. You can't tame magic. It plays by its own rules." I have read most of Agay's books and she's one of my faves bec of her distinct writing style. AWFH is my personal #1 (even though I haven't gotten the courage to reread it yet. LOL) but I feel like this book is where her writing flourished the most. 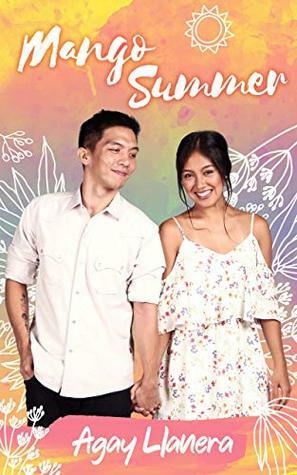 The magic of her narrative was complemented by it's unique theme that was distinctly Filipino; as well as the layers of the plot (age-gap trope, boyhood crush, pressures of society to marry, etc.). I laughed and cried and laughed while crying bec, huhu, it's amazing! "Yes, you can grab your life by the reins and run with it. Yes, you can believe that anything is possible. Yes, you can be happy." The romance is just SO GOOD! I don't want to say anything more so everyone else can enjoy it like I did, but let me just say, as the title suggests: Mango = Sweet. Summer = Hot. And I mean, Heat Level 3, my friends. SO GOOD! "I care about you too much to keep this a secret." For this particular book, I think the setting is the winner. I can almost see myself and my childhood back in my province of Batangas even if we didn't own our own farm. The childhood background between Fiona and G-boy were well fleshed out. I can almost imagine them hanging out every summer. The people living around the farm also reminded me of my own Titos and Titas. It was also realistic that both the exes, Marcy and Cliff, were not made into bad guys even if they were the ones who cancelled For this particular book, I think the setting is the winner. I can almost see myself and my childhood back in my province of Batangas even if we didn't own our own farm. The childhood background between Fiona and G-boy were well fleshed out. I can almost imagine them hanging out every summer. It was also realistic that both the exes, Marcy and Cliff, were not made into bad guys even if they were the ones who cancelled on their respective weddings/engagements. They weren't two dimensional characters either. They were living, breathing characters who were important parts of our main characters' lives. Nevertheless, I'm not so sure if I buy the whole Fiona and G-boy ending up together despite him being her bestfriend's brother. Yes, G-boy had a long suffering crush on Fiona but Fiona didn't see him in a different light until this last trip. Such a beautifully written book. The hero is lovely, so kind and smart and patient. The heroine is troubled and sad, but it’s wonderful to see her shake that off and come into her own. They both have had life-changing events and in the course of the story learn to live in their own skins. The older woman/younger man aspect is handled very well-not dominating the story nor swept under the rug. I loved how the secret of the mangos is revealed! This is one of the best books I’ve read this year. I love Agay’s writing style and storytelling because it feels like her words are courting you heart with its beautiful words. The way she describes the scenery transports you to the warmth of a Filipino small town. The food, oh god the way she described the food makes your mouth water. +Best friend's little brother! Fiona is 8 years older than Greg! Flip those gender norms! +Cookies! Really, Filipino food in general, but cookies! -It's narrated in 3rd person present tense! It gives the story a fairy tale quality which works for this story, but I find it awkward. A perfect book for the summer. It makes me crave for mangoes too.